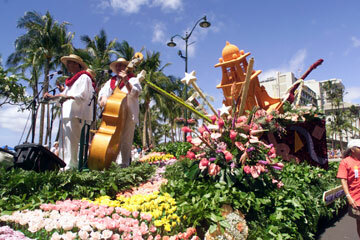 The Aloha Festivals Floral Parade promises breathtaking floats each year. This one was created by Sheraton Hotels in 2002. THE showcase events of the Aloha Festivals take place this weekend, so drape yourself in flowers and head for the parade, or perhaps the great street party downtown. It's the 60th annual celebration of the culture of aloha, and takes as its theme "Na Paniolo Nui O Hawai'i -- The Great Cowboys of Hawai'i," in honor of the Hawaiian cowboy. » Aloha Festivals Downtown Mele: 6:30 p.m. Friday on Bishop Street, from Beretania Street to Aloha Tower Marketplace. Food booths, dancing and musical entertainment on seven stages. Catch the Honolulu Jazz Quartet at 6 p.m., B.E.T. at 7, Melveen Leed at 8:15 and Sean Na'auao at 9. Free. » Aloha Festivals Floral Parade: 9 a.m. Saturday, Ala Moana Boulevard from Ala Moana Park to Kapiolani Park. Pau riders, floats, marching bands. 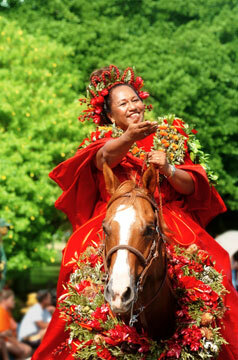 The Aloha Festivals Court presides over festival events statewide. 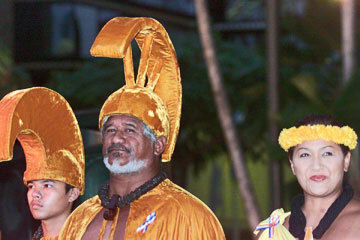 In 2001, King Jack Williams and Queen Uiilani Halbuna, above, attended the Downtown Hoolaulea. This year, the Aloha Friday Downtown Mele commences Friday. » Aloha Festivals 60th Anniversary Family Fun Day: Noon Saturday at Kapiolani Park. At the end of the parade route, get a leisurely look at the floats, and enjoy the arts and crafts. Admission is $5; free with Aloha Festivals ribbon. Children free with a paid adult. » Aloha Festivals 60th Anniversary Concert Celebration: 6 p.m. Saturday, Waikiki Shell. Featuring Cecilio and Kapono, Ho'okena, Welden Kekauoha, Melveen Leed, Maunalua and Sean Na'auao. Admission is $20; $10 with an Aloha Festivals ribbon. Children free with paid adult on lawn area only. Tickets available through Ticketmaster outlets and the Blaisdell box office. Call (877) 750-4400 or visit www.ticketmaster.com. » The 1st Annual 'Ukulele Contest: 10 a.m. Sunday, Aloha Tower Marketplace. Amateur ukulele players compete for thousands of dollars in prizes. Entertainment on multiple stages and ukulele lessons included. Free. Pa'u riders are a crowd favorite at the Aloha Festivals Floral Parade, which will march down Kalakaua Avenue Saturday. For the most current list of events, visit alohafestivals.com. To purchase an Aloha Festivals ribbon ($5) and receive the official 2006 program guide, call 589-1771.